I remember when I was a kid, one of my favorite times of the year was when we released ladybugs into the garden during Sunday School. They had boxes of ladybugs for us, and we got to set them free into the garden to help manage the pests. They'd crawl all over us, and we'd run around looking for where they'd landed in the dirt. Their bright red backs always stood out against the dark soil. 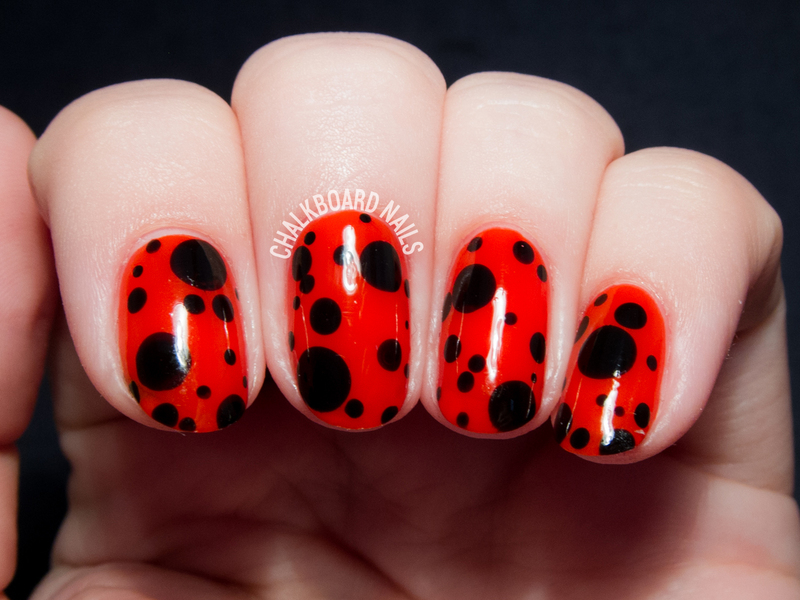 I think that butter LONDON has nailed that bright, vibrant red-orange ladybug color for this lacquer, fittingly named Ladybird. I applied two coats for the base - the formula is smooth and even. It has that sort of squishy feel to it, without showing any nail line. Then, I added some black spots in various sizes to take the ladybug look even further! Try using a pencil eraser to "stamp" on the largest spots, and a dual ended dotting tool for the other sizes. 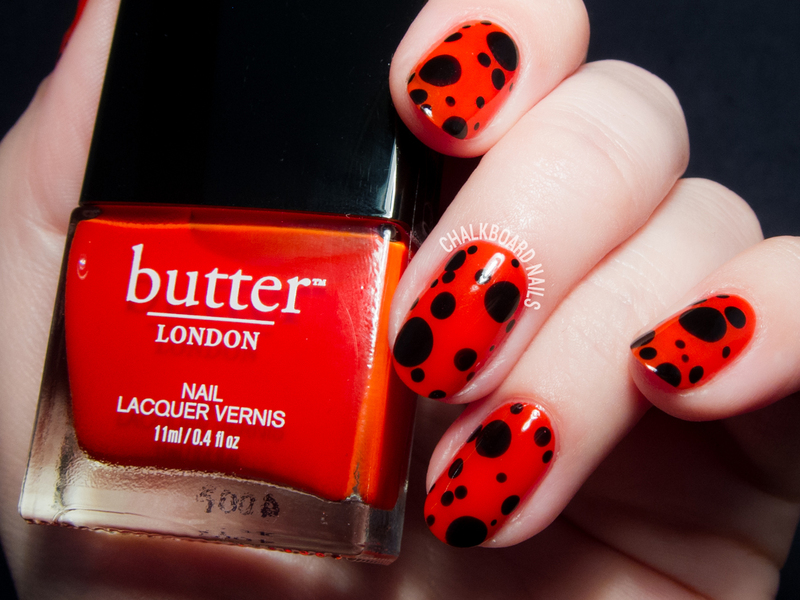 Ladybird is available through butter LONDON & Amazon. 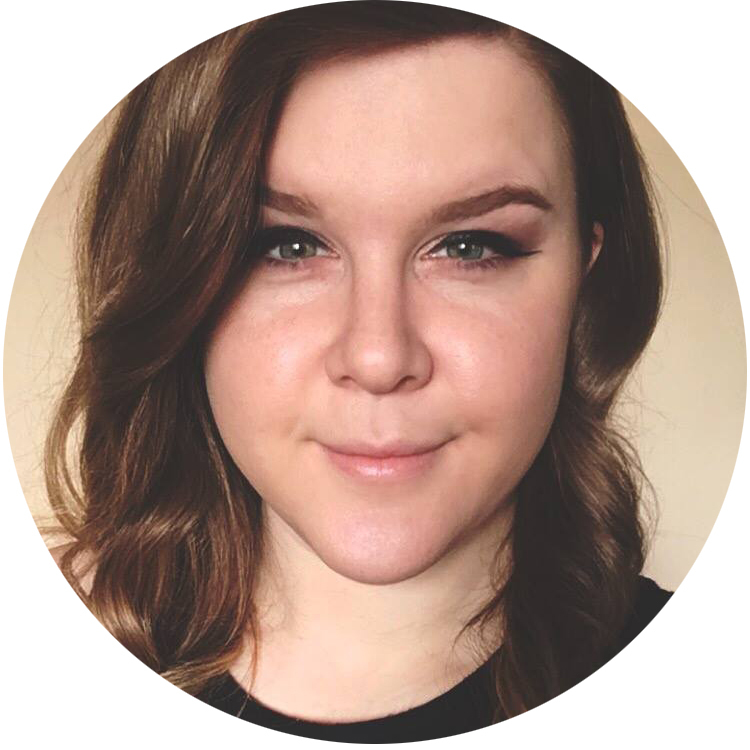 And PS, if you really like the color, check out their Ladybird LIPPY Lip Crayon! I was really digging this color! And the Lippy was such a nice orange/red. Ladybirds are one of my favourite insects too, they're so pretty and bright. I adore the red colour from Butter London, how pigmented is it? I am yet to try Butter London polishes but their range of colours appeals to me. What a beautiful mani! And definitely a great representation! I've always been really happy with BL formulas. I found it to be well pigmented, but it does have that sort of "squish" effect to it, which is to say it's not like a completely opaque flat creme. Super cute! Sometimes I love this type of simple design on my nails. Really cute mani. I instantly thought lady bug without even reading the caption or post. What a gorgeous ladybug design!! So smart of you to use a eraser to create the large dots! :D I LOVE this stunning red colour too! Nail school was great, I'm graduated now but still waiting for my state board testing. Got a couple of weeks left to wait out before my practical. OMG. This is so cute. I was looking for a color like this. I got a mint green instead from klarenewyork.com along with some other colors. What is the name of this polish? Beautiful, as always. How do you get your dots smooth? Mine always end up looking like beads. The biggest thing for me is making sure to use a good topcoat. 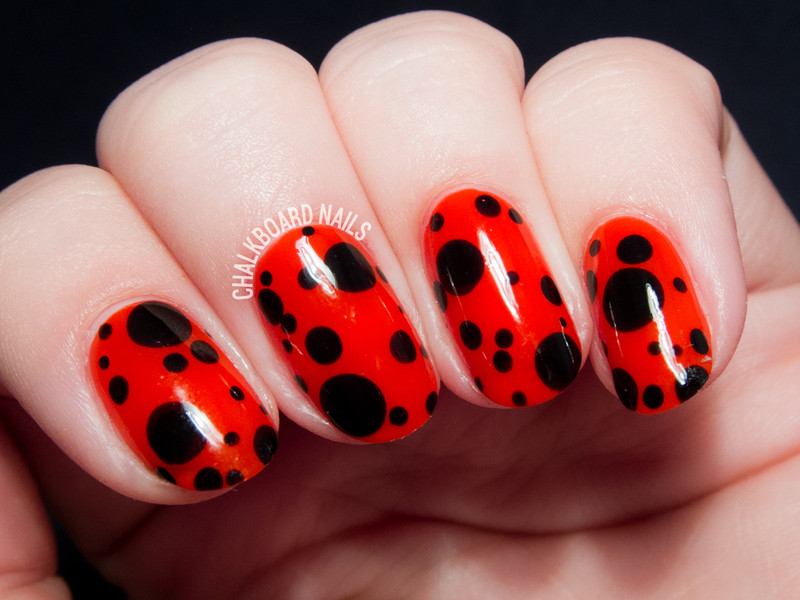 So something like Seche Vite or HK Girl will usually flatten the dots out. really cute naildo <3 and for sure they chose the perfect name for that red!